Earlier today I was listening to CBC Radio and there was a man who had made a guitar out of old re-purposed wood. The radio show in question was really a gardening talk show with a guest expert, but the topic turned to repurposing wood again when a caller called in with an ancient 250+ year maple tree that had been taken down and he was looking for people who would be willing to make art pieces, furniture, etc out of the old maple wood. As a bow maker I was instantly interested in the repurposing wood topic - and was already trying to get a turn on the radio show to ask a question about hardwoods and how long they should be dried before using them for woodworking projects. I tried over a dozen times to call in. Kept getting the busy signal. 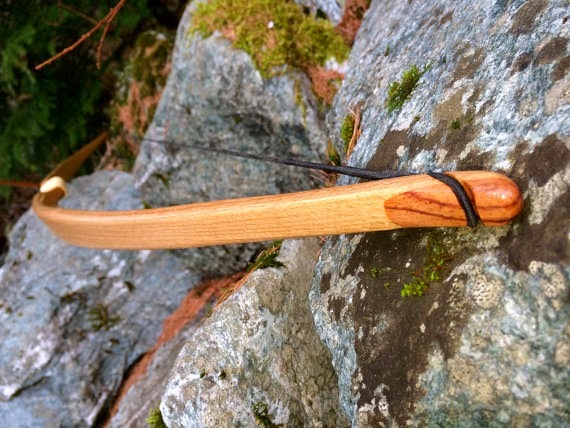 But the new caller got me thinking about how there must be other people out there who have old wood - especially hardwood - that can be repurposed for bow making and other woodworking projects. 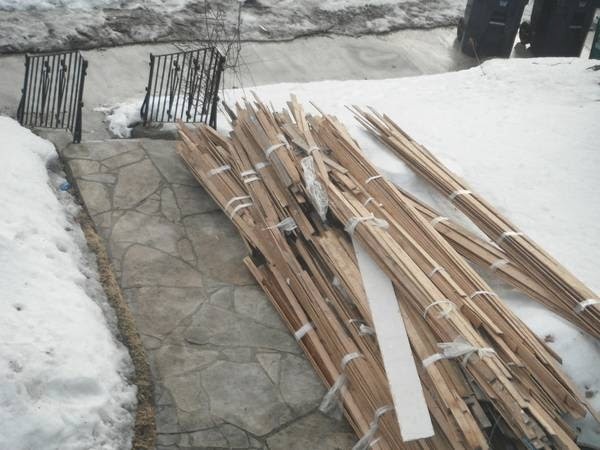 So I went on craigslist and went looking for people giving away free wood (pun not intended) and I found someone trying to give away oak hardwood flooring from the 1930s. The good thing about hardwood flooring is that it is already perfectly flat, planed smooth and for bow making you really just need to plane it a bit more, laminate several pieces together using Titebond III and you've got yourself something that would make a good bow. The truth is that people throw out old wood all the time. They don't know what to do with it all. Especially after the Ice Storm that rocked Toronto in December 2013. Here it is March 2014, and people are still removing old branches and even tree trunks from their lawns. Every time I pass by piles of such wood I spot large tempting pieces of wood that I want to just grab and stick in my garage for later. So if you have wood you don't need, and you live in Toronto, feel free to donate it to me. Leave a comment with your contact info below and I will get back to you.